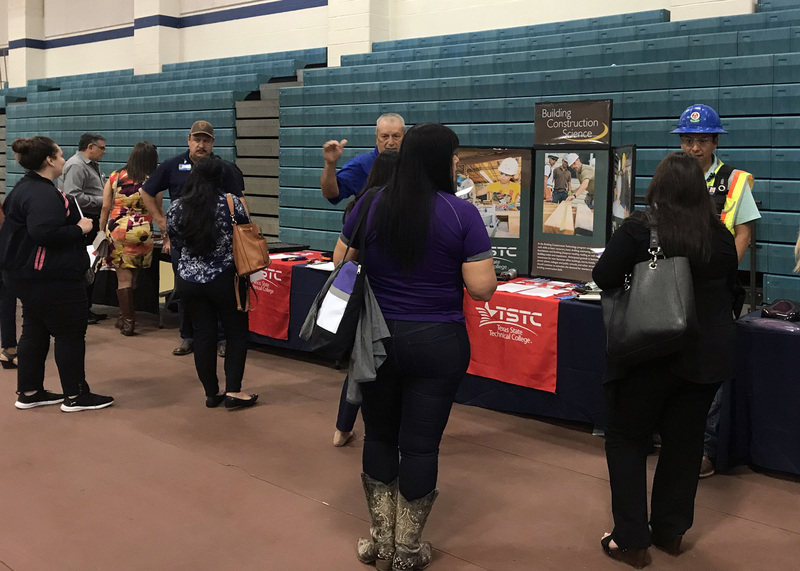 (HARLINGEN) – Diana Alejos went from exhibit to exhibit, speaking with faculty and learning about the more than 30 technical programs offered at Texas State Technical College in Harlingen, during the college’s annual Counselor Update hosted at the TSTC Wellness and Sports Center. “I enjoyed this event very much. Many of my colleagues agree that this was the best one yet,” said Alejos, migrant counselor at J. Economedes High School in Edinburg. Alejos was one of nearly 50 counselors from across the Rio Grande Valley who attended this year’s update. Gonzalez said changes were made this year to give counselors access to more information and update them on recruitment and enrollment processes, dual enrollment and student learning. In the past, the update has consisted of a campus tour and an in-depth look into at least three or four technical programs. 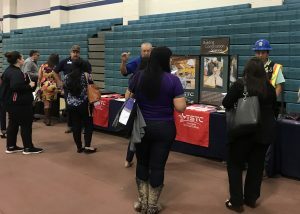 But this year, TSTC created a program showcase, giving counselors access to every program on campus and the opportunity to speak with faculty from every program. Gonzalez said the changes to this year’s event were met with positive feedback. “It is my goal to get all of the information I can to better serve our migrant population. I definitely gained a lot by attending this update and have a lot of information to pass along to our students,” she added. Counselors were treated to a breakfast and lunch catered by TSTC’s Culinary Arts students; a message from the keynote speaker, local attorney and TSTC alumna Krista Guiter, who discussed her experience at TSTC and spoke about empowering young girls to get a higher education; and presentations from three TSTC students: Bianca Moreno, Juanita Salinas and Carlos Obregon. Obregon received an associate degree in Computer Maintenance Technology in 2016. He is pursuing a second associate degree in Health Information Technology and works as a community assistant for TSTC Housing. He said he enjoyed sharing his TSTC experience with counselors and hopes that his words made an impact and can help other students. “I hope counselors will be inspired to tell their students about my experience, especially as a migrant student. Education is not always first on our priority list,” said Obregon. “I also had a great migrant counselor in high school who pushed me and motivated me to continue my education. Without her, I wouldn’t be here. And because she was at the event, I got a chance to thank her personally,” he added. Gonzalez said she hopes to maintain the new event format for future Counselor Updates, which are hosted statewide among TSTC’s 10 campuses. To learn more about TSTC and the technical programs offered, visit tstc.edu. This entry was posted in Harlingen on October 15, 2018 by Amanda Sotelo Sotelo.